With another round of ‘Resort Politics’ drama playing out, BJP is looking to stop Congress’ winning streak and form the government in Karnataka. Bengaluru: Karnataka began the trend of what is now popularly called, ‘Resort Politics’ with B.S. Yeddyurappa, former chief minister and current Karnataka BJP chief. He successfully employed the strategy of confining MLAs to a hotel resort to ensure they are not poached by another political party. Currently, another episode in this drama is playing out in the state. At a Congress legislative party meeting Friday, 77 MLAs of 80 were present. They have been herded into the now famous Eagleton Resort on the outskirts of Bengaluru as it has become ‘the’ place to keep legislators safe. The resort falls in the Bangalore rural Lok Sabha constituency which is represented by senior Congress leader D.K. Shivakumar’s brother D.K. Suresh. It’s the same resort where the Congress housed the Gujarat MLAs before the Rajya Sabha elections in 2017. The latest Congress move follows the Karnataka BJP’s shifting of its 104 MLAs to a resort in Gurugram near Delhi, last week. ‘Operation Kamala 3.0’ is the term given to the BJP’s efforts to woo MLAs from other parties to form or pull down governments. In the present context, it is to pull down the Kumaraswamy-led JDS-Congress coalition. At Friday’s Congress meeting, one missing Congress MLA wrote in with personal commitments, leaving Ramesh Jarkiholi, the senior Congress leader who had led the rebellion against the present government, out of the fold along with Chincholi MLA Mahesh Kumathalli. The Karnataka Congress has sent show cause notices to them, asking why they should not be expelled from the party. Last Tuesday, two Independents, R. Shankar and H. Nagesh, had crossed over to the BJP. This boosted the BJP’s tally to 106 from 104. The political drama began when four unhappy Congress MLAs decided to shift to a resort in Mumbai and woo more MLAs to their side. They were unsuccessful as three returned to the Congress. The question everyone wants answered is: why does BJP want to topple the Kumaraswamy government, so desperately? Also read: Karnataka crisis: Can horse-trading be checked or should it be accepted as part of politics? The BJP is the single largest party in the state. However, BJP leader B.S. Yeddyurappa was still unable to form the government. On the day of the trust vote, he fell eight short of the majority mark, forcing him to resign even before the floor test. This hurt the former chief minister, immensely. Since then, BJP has made several attempts to poach MLAs from the Congress-JDS alliance. 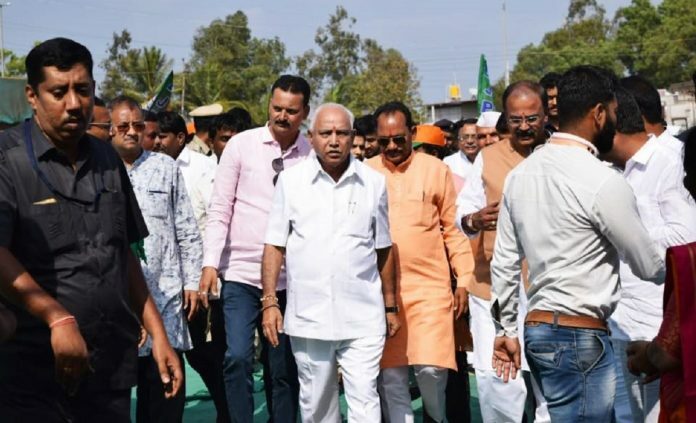 Yeddyurappa is using all his political acumen and experience to win over legislators to show the BJP high command that he is not giving in without a fight before the Lok Sabha elections. For Yeddyurappa, this may be his final chance to be chief minister. He turn 75 in February this year and if the BJP’s 75-year age bar holds firm, his chances to be CM are numbered even though he remains BJP’s best man to reclaim their southern citadel. With the BJP at the Centre, the party wants its government in Karnataka before the Lok Sabha elections. It would, thus, regain power in the state, its first in the south, and give it more leverage in Tamil Nadu, Kerala, Telangana and Andhra Pradesh where it is keen to make inroads in the Lok Sabha elections. If the BJP is able to reclaim Karnataka, they hope to stop the winning streak of the Congress, especially across the Hindi belt. In the south, regional parties like AIADMK, DMK, TDP, TRS and the CPM-led Left Democratic Front have grown stronger. So BJP’s only hope is Karnataka. BJP hopes to send a signal to the country that it has put the Congress on the back foot — that its recent assembly losses in Madhya Pradesh, Chhattisgarh and Rajasthan are a temporary setback. In the 2014 elections, the BJP won 17 of the 28 seats in Karnataka — Congress won 9 seats and the JDS 2. However, the Congress-JDS have announced a pre-poll alliance and are hoping for 18 to 20 seats, together. After losing in the Hindi heartland, BJP wants to show voters it will leave no stone unturned to reach the 272 magic mark — even if it means making repeated attempts to topple Congress-led governments across the country.